Glorious sunshine helped our ‘Clean for the Queen’ litter pick in Brandwood End today. A dozen volunteer and the local Ranger dodged the heavy traffic in the Cemetery today to collect 32 bags of litter! Most of the collected rubbish consisted of flower papers and we would like to appeal to visitors again to remove the papers from flowers left at grave sides. The recent winds have created pockets of rubbish along the Sunderton Road boundary fence and Broad Lane, which will soon be enveloped in brambles so todays efforts were well worth while. Our thanks to our volunteers and the Ranger for giving up their time on Mothering Sunday and we hope to see you all again at our usual quarterly litter pick in June. We were also able to use this event to promote membership of the Friends and an awareness of what we do in Brandwood End. All the volunteers were amazed at the volume of traffic that we observed passing through the cemetery today. With vehicle numbers in the hundreds every hour, speeding was not an issue and there were queues on all the main drive areas! All in all….a good mornings work. Cars and Crocus flowers for Mothering Sunday ! The main drive of the cemetery was a riot of colour today as Crocus flowers and Snowdrops vied for position in the sunshine. The Cemetery was looking good for Mothering Sunday and the constant stream of vehicles carrying relatives visiting their mother’s and grandmother’s graves were a testament to the amount of visitors that Brandwood End still receives. Could this mean Spring is on the way! Beautiful day today in the Cemetery. Sunshine, snowdrops(mainly leaves!) and the Woodpecker hammering away. 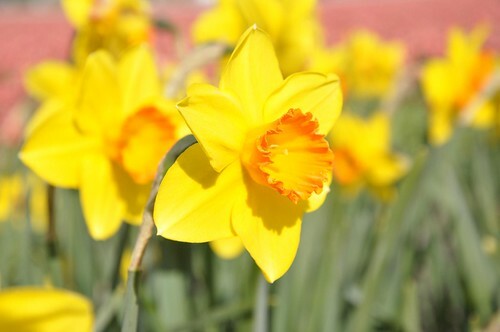 Everywhere you look the daffodils are blooming and blossom trees are in bud. Muntjac are calling…….maybe all a bit early in the year? Every few days one of our committee strolls (or drives) around the cemetery to see what has been happening. The Tree Officer tells us that, despite loosing one large aged conifer at the far end of the cemetery, we escaped severe damage in Brandwood End. A number of fallen branches were also reported to him by Bereavement Services and they have also been dealt with. Several years ago the members of FBEC spent back breaking hours planting patches of aconites, snowdrops and several thousand crocuses. You may have enjoyed the aconites and snowdrops as you strolled along the main drive but only 2 clumps of crocuses remain near the Oak Tree Island. Much to our annoyance all of the remaining crocus bulbs were dug up and, as far as we were concerned, eaten by the squirrels! Apparently they are a favourite with them…….. Today, whilst litter picking close to D1 we suddenly noticed a shimmering patch of blue. One of 2 remaining crocus clumps! On closer investigation we discovered a swathe of blue crocuses in an area that we would never have planted in! It would appear that one or two of the greedy squirrels dug up our bulbs and reburied them in their ‘larder’ area and then either forgot them or couldn’t remember where they were…… What a beautiful show these bulbs now make. Perhaps we will forgive the squirrels their greed! Our ‘stolen’ crocuses several years on. Early in 2009 we reported that one of our latest projects was to produce a new feature to the Cemetery by the planting of spring flowers along the main drive. We planted some 14,000 spring bulbs, in various locations along both sides of the main drive, from the Superintendent’s Lodge down to the bottom of the drive at the Broad Lane gate. The local squirrels certainly enjoyed the project as we found out to our cost – following us around as we planted bulbs they dug them up! However, the majority survived and we do hope that you enjoyed the first showing of these spring flowers in 2009, which will now hopefully be a permanent feature to the cemetery for the years to come. Now we have to see if the project has stood the test of time, and of course the squirrels, and we look forward to another lovely display in the Spring of 2010 – not too far away now! !